Councillors have voted to pedestrianise a stretch of road where five people died after being struck by a bus. Thousands of people signed a petition calling for improvements to Sea Lane at Ingoldmells, near Skegness, after the accident last Easter. Joanne Warren from Leicester, her sons Jacob, aged five, and four-month-old Leyton, along with Richard and Paula Rhodes, from Mansfield, all died. The county council agreed the measures for an 18-month temporary period. Neal Cooper, whose daughter Paula and son-in law Richard Rhodes died, said: "Should they decide...that they are not going to continue with the pedestrianisation following this trial period, then we have the backing of our local MP who will take legal action to enforce it." The driver of the bus, Stephen Topasna, 51, from Bridge Street, Louth, has appeared in court on five counts of causing death by dangerous driving and was bailed to reappear in April. 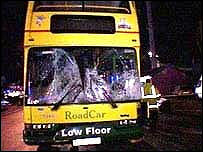 The bus company, Lincolnshire Roadcar, appeared before Skegness magistrates in February in connection with the crash. The firm asked for more time to study technical reports before entering a plea to an offence of using a vehicle with defective brakes.